First off let me say how big of a fan I am, I think the roster on your label is truly top notch. The reason I am writing to you is that I feel you have a very special band in your very able promotional hands called Night Moves. Having worked in the industry for more than a decade before making the switch over to the world of tech, I have witnessed many of my favorite bands go completely unnoticed after delivering brilliant records to their label. The world of social and digital are leveling the playing field and giving every artist a much better chance at success but there has to be a solid strategy in place, especially in the world of real time engagement. I think you have a chance to break this artist wide open and show the world that there are still unique band’s out there paving their own way. With that being said, here’s what I would do if I were putting together a plan for Night Moves to make some waves in the overly crowded buzz bands of 2013. Huge opportunity for some low hanging fruit on Facebook. 1. Fix, track, and follow up with all downloads – This is super important. These are folks who come to the page for a sample and will likely purchase the record or better yet, tickets to any upcoming shows. This is a perfect entry point to start the relationship with the fan. 2. Relationships are the New Currency – The beauty and power of Facebook is its ability to connect the artist and the label directly to the fans and build a solid relationship. The next step is to amplify and break through your initial reach to the coveted friends of friends . The real power of social media comes into play with peer to peer recommendations. The job of the marketer is create an experience for your fans and give them something to share while making sure that the content you provide is very easy to do so. There are tons of opportunities to engage and reply to fans here. It makes all the difference in the world. 3. People Talking About This – Super important metric. It’s the barometer of your overall Facebook presence and the ultimate guide to whether or not your are engaging with your fans and providing the right content for them. The ratio of people talking about you correlates to the number of fans that will or will not see the content you post to your page. The idea here is to keep the affinity high with fun visual posts then drop your most important messages in directly behind so that your calls to action can ride on that wave of virality. 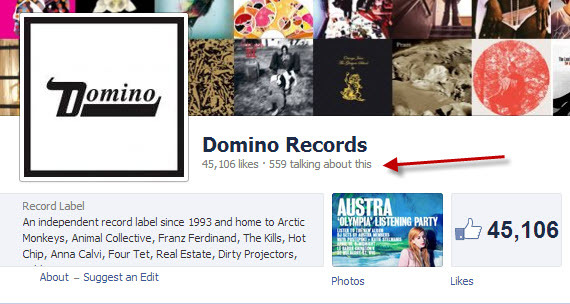 You guys are a super fun record label with over 45K fans. I would like to think that you could easily get that number up to 100K with a tiny bit of paid Facebook ads/ sponsored stories and a more visual approach to your content. In turn you will drive much more traffic and in the end more sales. By the way, need some visuals to share? I have photographed the band twice and no one has ever reached out and/or shared any of my band shots with their page. Give it a try and watch the results from a visual approach. I would be posting 3-4 big visuals a day, all tied back to a call to action. With Facebook’s new Timeline launching this is only going to become much more important. Tons of opportunity for BIG BOLD visuals in the bands timeline below. 3-4 posts a day using a visual approach will increase engagement 10x in the first week, I promise you that : ) Need more content? Crowdsource the photos and tag the photographers. The Bad: A follow up to this girl could be a game changer and make her think twice. 5. 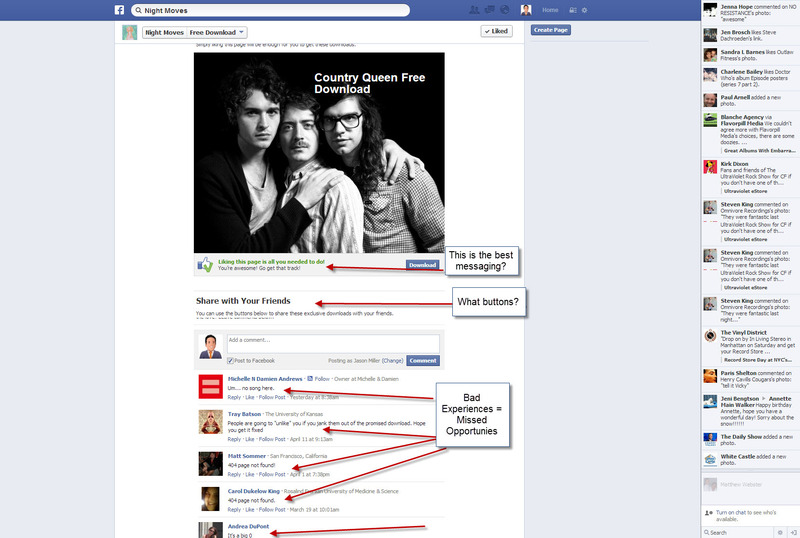 Make a Competitive Play – Facebook has some amazing targeting options for sponsored stories and newsfeed placements. 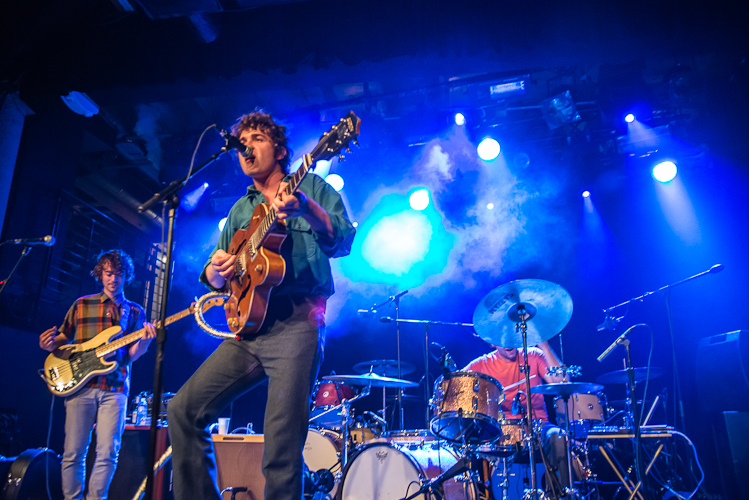 MGMT has a new record coming out and there’s a pretty big buzz around it. 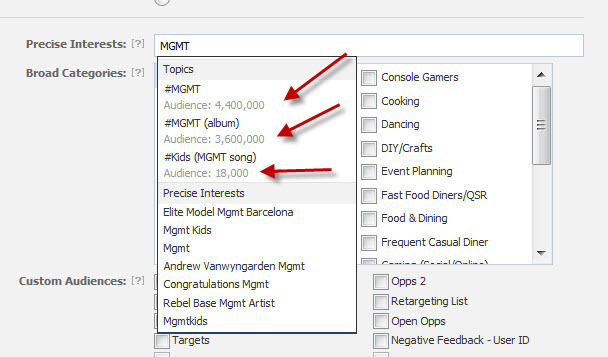 Why not run some targeted interest adds around folks who Like and or are talking about and searching for MGMT. Huge potential here and if you target it correctly the CTRs can be as low as a nickel! And that’s just for starters. I would go on Amazon and find what others are purchasing and viewing around Night Moves, MGMT, Frightened Rabbit, etc and run targeted ads around those as well. These are just a few of the things that I see huge potential for Night Moves. I actually wrote an entire ebook around the topic as well. 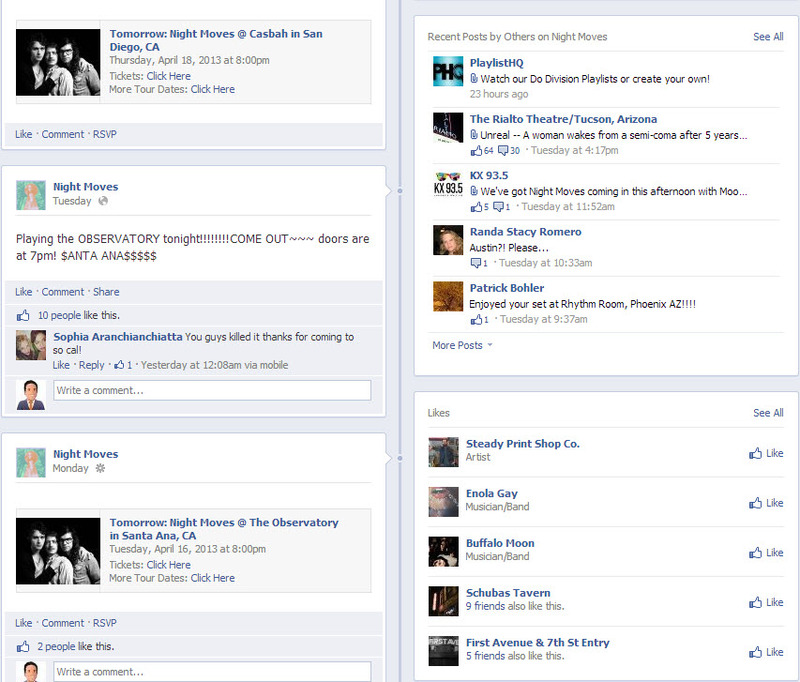 My main point here is that I love your label and I love the band Night Moves. I hope they become the next breakthrough artist of 2013 because there they are so incredibly talented as both songwriters and performers. Thanks for reading, and know that you have a lifelong fan spreading the good word here in San Francisco. PS: Brid and Mona at Tell All Your Friends PR are amazing at their jobs. The entire reason why I found this band in the first place. Love them.